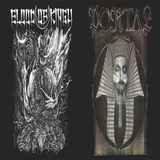 With their short one track per band split Portal and Blood of Kingu display some of the most barbaric death metal you can hear. And it is not the level of down tuned production or blasting density, but it is in how much malevolence these two tracks project. Relatively unknown Portal takes the stage first. This Australian (not the Swedish) band has actually been producing in the underground since the turn of the century and Trapezgedron is actually an old 1999 track, which for some reason was never released. After awakening the beast for the first minute the Aussies then build up their guitars layer by layer, until arriving at the repeating obnoxious nasty drilling repeating loop, which is going to be responsible for penetration the rest of the way. Just like Blood of Kingu later Portal also deploy deep bellowing vocals to reinforce the point. Mysterious Blood of Kingu does not waste any time to launch into Destroyer of Everything Infinite and Timeless. As Blood of Kingu is the more direct deathly project of Roman Saenko (Drudkh, Hate Forest, Old Silver Key) the composition is death metal at its core. Furthermore, unlike some other Blood of Kingu records I do not necessarily hear keyboards or wistful mystique on the Destroyer of Everything Infinite and Timeless. Experimental and atmospheric this track is not. Drums and bass go off in the background like constantly exploding grenades, while guitars take on a more dizzying jazzy slides compared to Portal’s ugly steadiness, and for Blood of Kingu guitars serve as a constant magnet of attention. For the true death metal fanatics interested in what underground can produce.